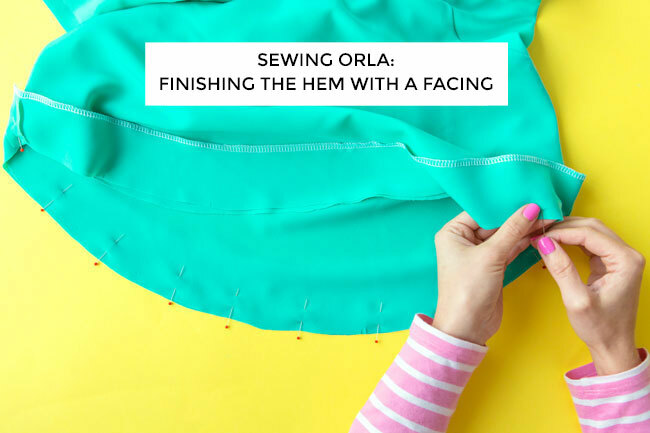 It’s the final step in the Orla sewalong – woooop! Congrats if you’ve made it this far – the remaining steps are a nice and easy way to finish. If you haven’t been following the sewalong, you can join in at any time – order your pattern and bookmark the sewalong page which has links to all the steps. So all we have left to do is the hem. 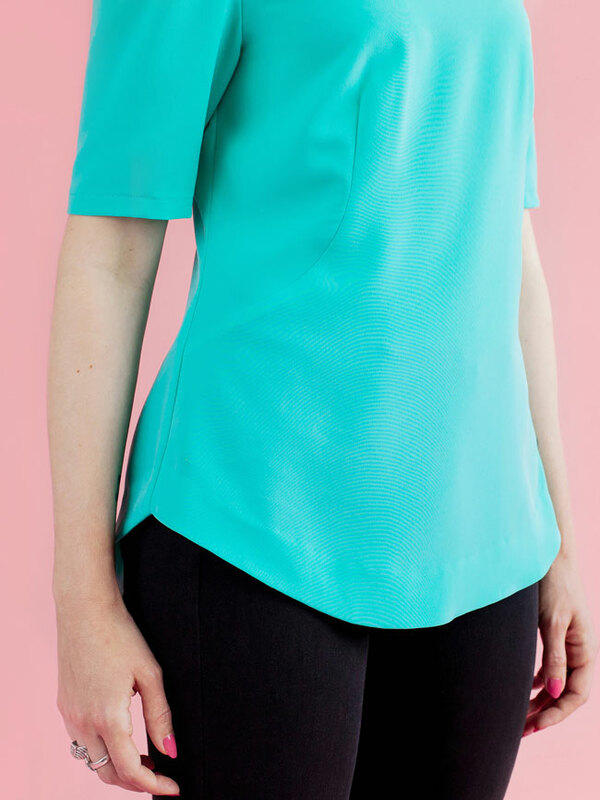 The dipped hem is one of the distinctive design features of the Orla top. 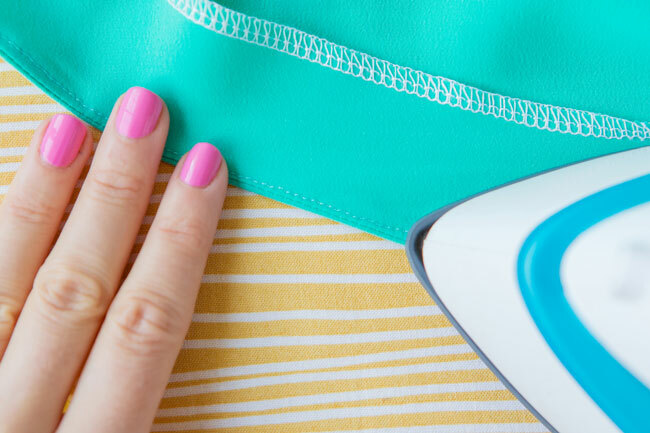 Rather than trying to fold the hem to form the curves and side seam inner corners, we’re going to sew a facing to it, which creates a lovely and neat finish. Before we begin, remember that if you took in the side seams at the hem of the top, you’ll need to take in the hem facing by the same amount. Lay the front hem facing over the back hem facing, right sides together, and pin them together at either side. Stitch. Trim the seam allowances and press them open. 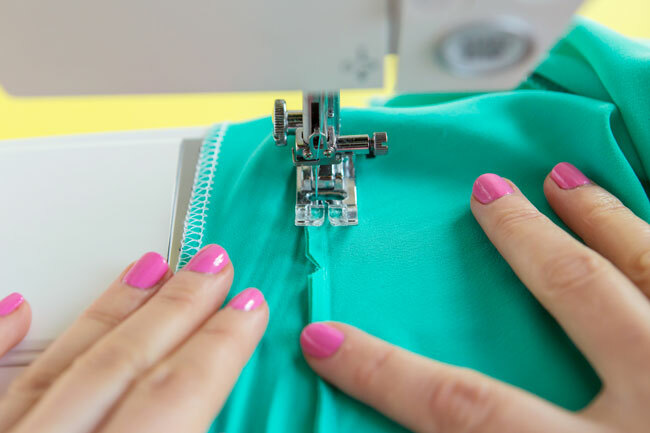 Finish the upper edge of the facing – the edge without notches – using zigzag stitch or an overlocker (serger). Lay the bodice out right sides out, the front facing up. Lay the facing out below the hem of the bodice, wrong sides out, the front facing up. 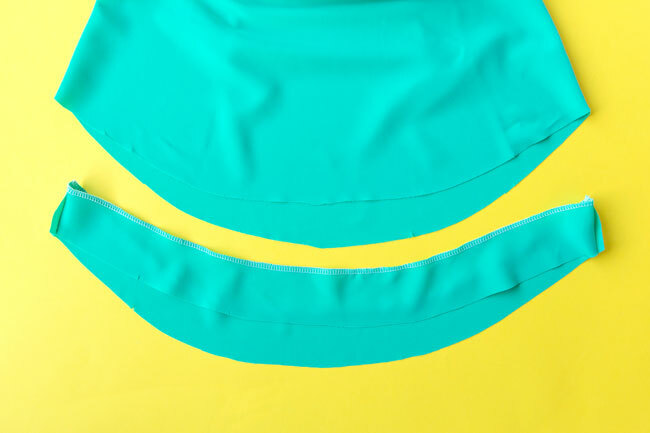 The front of the facing has a shallower curve than the back to match the dipped hem of the top. Slip the bodice inside the facing so the right sides are together. Pin them together at the raw edges, matching up the side seams and notches. 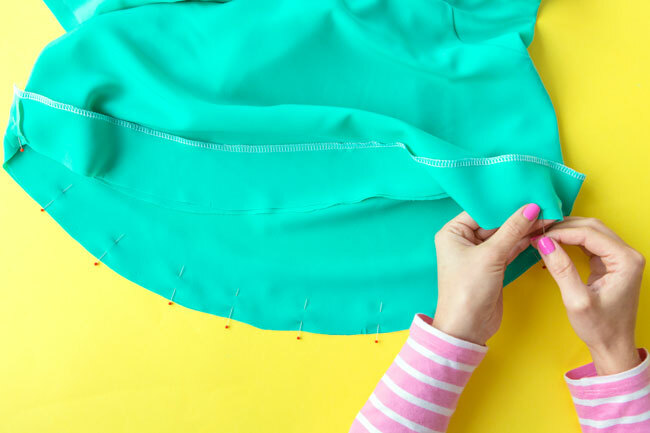 Starting at one of the side seams, stitch the facing to the bodice, taking your time to sew the curves smoothly, and pivoting the fabric with the needle down when you reach the other side seams. 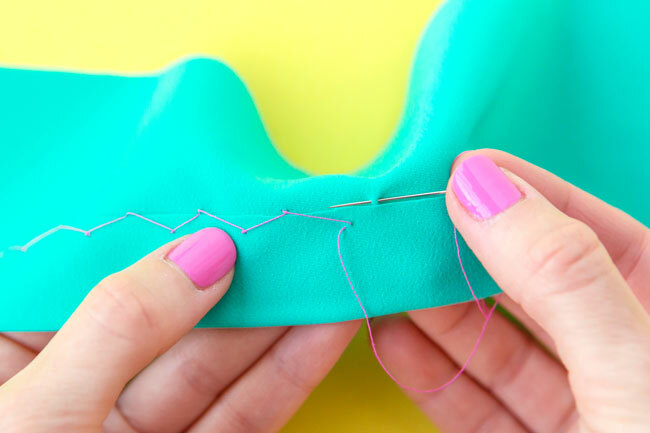 Trim the seam allowances and cut triangular notches into the curves and side seams, taking care not to cut through the stitching. Press the seam allowances open to help define a neat seam line, then press both the facing and seam allowances down. Understitch the facing to the seam allowances close to the seam. Remember understitching from when we sewed the neckline facing? This will help keep the facing from flipping out to the outside of the top. Press the facing to the inside of the top, rolling the seam line slightly to the inside so it’s not visible from the outside. A bit of steam will help soften the seam to make rolling it easier. All you need to do now is stitch the loose, finished edge of the hem facing to the inside of the top. You can topstitch it on your machine using a a 35mm (1 3/8in) seam allowance. 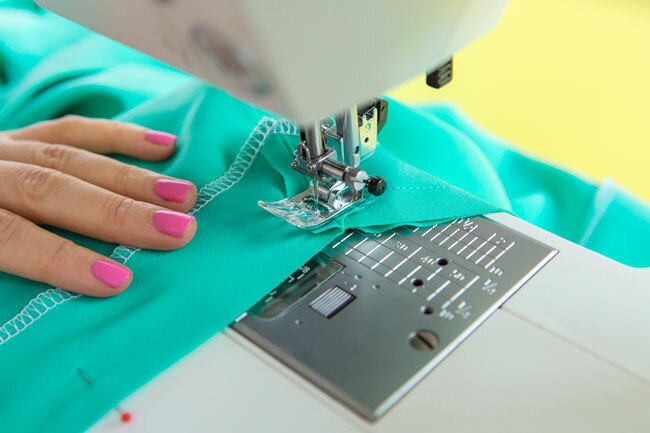 Or if you don’t want the stitches to be visible from the outside, and are the patient type, you could do a hem stitch by hand, such as a catch stitch. Wanna catch stitch? Starting at one of the side seams, knot the thread on the wrong side of the top edge of the hem and stitch through to the right side of the hem. 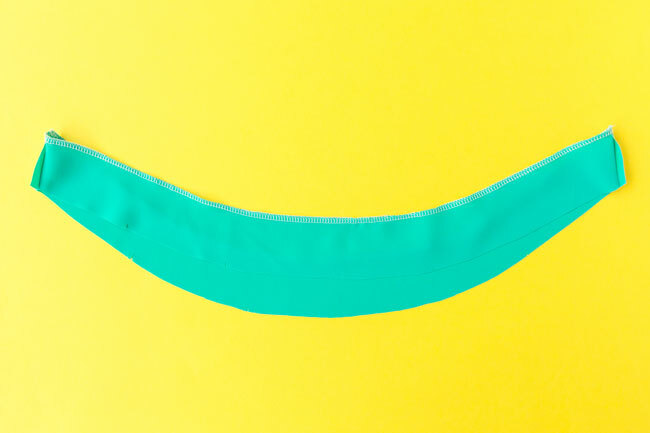 Sew a teeny tiny stitch through the bodice fabric diagonally to the right of the hem edge (left if you’re left handed), from right to left (left to right if you’re left handed). 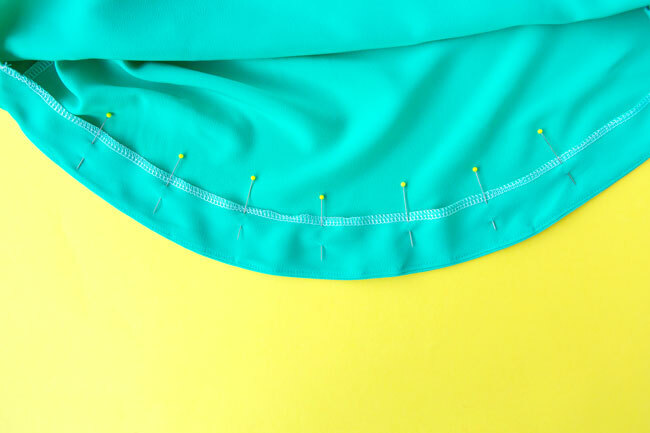 Pull the thread back down right and take a little stitch at the top of the hem facing, again sewing from right to left. So you’re kinda sewing backwards and forwards at the same time – the stitches are moving forwards but you’re inserting the stitches backwards, if you see what I mean. Keep the stitches teeny so they are almost invisible from the right side of the top (I’m just using pink thread so you can see what I’m doing), with about 5-10mm (1/4 – 3/8in) between the stitches. Repeat until you’ve come full circle, then knot the threads and admire your handiwork. Give your lovely Orla top a final press and feel mighty proud of yourself – you’ve finiiiiiished! Excellent work. I hope you enjoyed the sewalong. We’d LOVE to see what you’ve made. Please email us a picture of your finished Orla top to lookwhatImade [at] tillyandthebuttons.com. Alternatively if you want to post it on your own Instagram or Twitter feed, tag us in @TillyButtons and use the hashtag #SewingOrla so we can find it. We’ll be showcasing some of your Orla tops on the blog on Wednesday 11 November 2015. If you’d like the chance to be featured, submit your photos by 9am GMT on Monday 9 November 2015. We like to feature bright, focused, uncluttered images, at least 650px wide and preferably portrait format. Can’t wait to see!